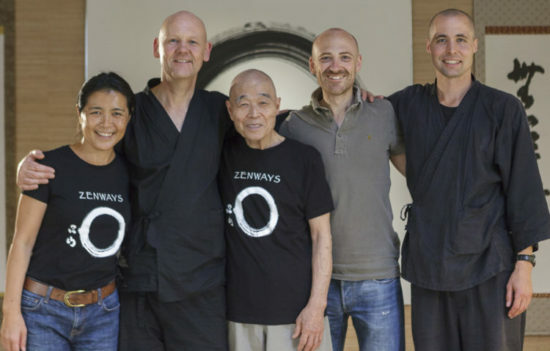 Shinkai received his Junior Zen Teacher certification from Daizan Roshi of Zenways Sangha in London and his Senior Zen Teacher certification from Zen Master Shinzan Miyamae (1935-present) of Gyokuryuji Temple in Gifu, Japan in 2014. He started his training with Shinzan Roshi and Daizan Roshi in 2004. Shinkai spent two years practicing at Bukkokuji Temple in Fukui, Japan under the Soto Zen Master Tangen Harada (1924-2018). He received permission to teach Zen jinshin and Zen yoga from Daizan Roshi. Daizan inherited the Zen jinshin tradition through his Soto Zen lineage side. Shinkai learned Zen taiso during his time at Bukkokuji Temple and through the personal yoga and organ massage practice of Shinzan Roshi . Currently on faculty at the University of Oregon’s PE Mind-Body Department, Shinkai has also led children’s yoga classes at Saraha Children School, one of the first Buddhist elementary schools in the country, for many years. He occasionally works as a substitute teacher there. He was the co-founder of the Edison Elementary Mindfulness Program for teachers/staff and does mindfulness workshops for the city of Eugene; he leads retreats and teacher trainings state-wide as well as Zen jinshin workshops and Zen yoga and Zen taiso classes.